The official weigh-is for “UFC 209: Woodley vs. Thompson 2” took place Friday in Nevada, but the drama unfolded at a nearby hospital. The UFC once again conducted an early weigh-ins for this event, so most of the fighters’ official weights have already been registered. However, if you can stream the ceremonial weigh-ins live right here on 5thRound.com starting at 7PM ET/4PM PT. Undefeated lightweight Khabib Nurmagomedov was taken to the hospital hours before today’s official weigh-ins. It is unknown exactly why Nurmagomedov became ill, but it is being widely speculated that it was due to weight cutting. His interim title bout with Tony Ferguson, UFC 209’s co-main event, has been canceled. For what it’s worth, Ferguson made weight at 154.5 pounds. 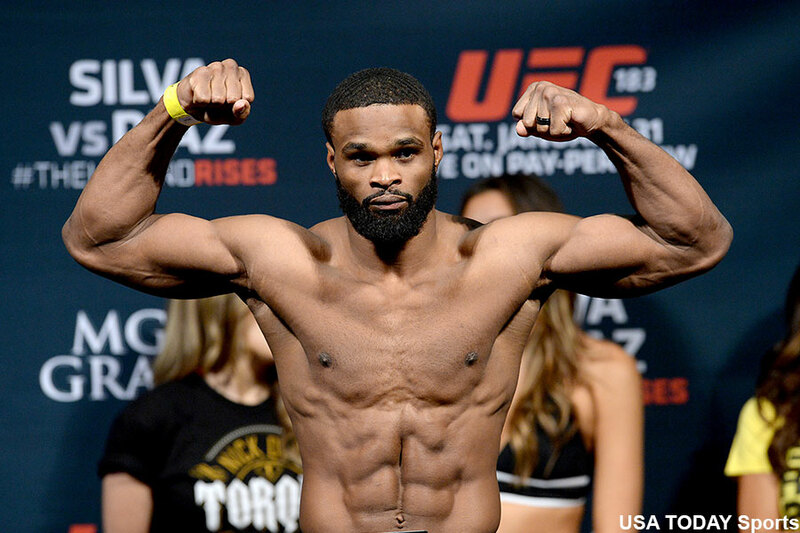 The good news is the main event between welterweight champion Tyron Woodley (pictured) and Stephen Thmompson is good to go after both fighters made weight for the rematch. Woodley weighed in at 170 pounds on the dot, while Thompson clocked 169 pounds.